Exuma Cays Land & Sea Park is a no take zone by land and sea. Leave no sign of your visit but footprints in the sand and ripples in the water. Commercial air service is available at Staniel Cay. Charter services can land at Normans Cay. There is no anchoring in the northern mooring area at Warderick Wells. Anchoring is permitted only outside of the outer marker buoys at the Emerald Rock mooring area. Payments can be made via the BNT website. ECLSP Fees; Fees Tab. Exuma Cays Land & Sea Park Website A new and excellent site with detailed information about the entire Park. Park Boundaries: ECLSP area extends from Wax Cay Cut in the N to Conch Cut in the S and includes 4 nm on each side of the cays. There are no support facilities or services available in the Park other than moorings and internet via wifi. The Park is a special place to cruisers; many return year after year. If you are a member of this group, you will want to do something extra to support the Park: Ways for cruisers to support Exuma Cays Land & Sea Park. Bahamas National Trust. 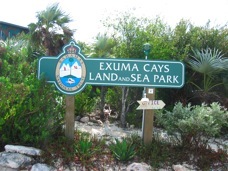 Webpage for Exuma Cays Land & Sea Park. The ECLSP Office hosts a book exchange. Warderick Wells Cay lies in the geographic gap between BTC cell phone towers at Highbourne Cay and Staniel Cay. As of Spring 2014, there was no reliable cell phone service from the anchorages. However, from atop Boo Boo Hill, connection to the Staniel Cay tower is sometimes possible. A BTC repeater has been installed on Bell Island which may improve service in the local area. In Dec 2014, it was possible to get BTC cellular data service from the anchorage using a cellular signal amplifier and elevated antenna. However service was spotty. For true emergencies, contact ECLSP Headquarters on VHF Ch-09 or Ch-16. The ECLSP office accepts requests and assigns moorings at 0900 each day on VHF Ch-09. The ECLSP office monitors VHF Ch-09 during office hours (0900-1200, 1300-1600). The Park office has a pier with dinghy landing - it is usually busy; use a reasonably long painter. There are many sandy beaches available for dinghy exploring. The Hutia a small mammal unique to the Bahamas that was an endangered species. A number of years ago, an experiment was begun to reintroduce them to Warderick Wells Cay. As there are no natural predators for the Hutia on the Cay, the population has grown immensely. They are now a common sight particularly after sunset. As of January 2012, they had denuded the upper layers of the vegetation canopy along the entire island. There is no agreement on whether the experiment should be allowed to continue or if any intervention would be effective. Caution: due to increased dead foliage due to Hutia predation, the potential for fire has increased substantially. Grouper: ECLSP is the source of about 80% of the Grouper caught in the northern Exumas. Conch: ECLSP has a Conch population about 38 times that of the surrounding area. Crawfish: ECLSP Crawfish have helped repopulate cays and reefs up to 90 miles away. The closest source of fuel is Sampson Cay and Staniel Cay to the S and Highborne Cay to the N.
Exuma Cays Land and Sea Park is administered by the Bahamas National Trust a non-governmental agency. There is an on-site Park Administrator and Wardens who manage and patrol the park. ECLSP Administrator: Joseph Ierna Jr. The nearest sources of provisions are Compass (limited), Sampson, and Staniel Cays. Warderick Wells Cay is the headquarters of Exuma Cays Land & Sea Park (ECLSP). The park was established in 1958 to preserve and maintain the delicate ecological balance of marine life in the Bahamas. Ice is available from the Park office. WiFi is available at both the North and Emerald Rock anchorages through the Park Headquarters using a commercial satellite service provider. In Dec 2014, a one-day user id and password from the park office costs $15. This enables access for 24 hrs or 100 Mbytes - whichever expires first. In Dec 2014, it was possible for SV Onward to get BTC cellular data service in the anchorage from the Staniel Cay BTC tower using a cellular signal amplifier and elevated antenna: a stand-alone battery operated cellular modem (e.g. a MiFi) or smart phone with wifi hotspot capability can be placed in a waterproof bag and hoisted up a mast) However service was spotty. There is an exchange library in the Park Office. There is no regular mailboat service. Contact the Park Office in case of medical emergency. Note: As of 1 September 2014, BNT increased the fee structure for moorings at ECLSP based on boat length. It is also possible to pay for moorings on line. Mooring Fees & On-line Mooring Payments; Select Fees Tab. There are 3 mooring fields: Northern, Emerald Rock, and Southern at Hog Cay. Moorings are assigned by the ECLSP office. An assignment is needed before you can pick up a mooring. The Northern anchorage is at the N tip of Warderick Wells Cay and opens on to Warderick Wells Cut. It is near the Park office and offers good all-around protection. There are 3 outer moorings and nineteen inner moorings. The outer moorings can accept vessels to 150"; they are exposed to the NE. The Emerald Rock is located on the W side at the approximate center of the cay between Emerald Rock and the Malabar Cays. The field is open from the SW to NW. The Southern mooring field, located between SE tip of Warderick Wells Cay and Hog Cay, must be approached from Exuma Sound. The southern field offers all-around protection from wind but the seas swell can penetrate a bit when winds are strong from the NE. ECLSP does not accept mooring reservations but maintains a waiting list. Requests for moorings may be made 24 hrs in advance. The Park accepts requests for moorings each morning at 0900 on VHF Ch-09. Moorings are assigned each morning and the boat name is broadcast on VHF Ch-09 when the assignment process is complete, usually before 0930. If you cannot participate in the 0900 request process contact the ECLSP office on VHF Ch-09 when in range of ECLSP. Note: see Cambridge Cay, Hawksbill Cay, and Shroud Cay which are part of the ECLSP and also offer moorings on a first-come-first-served basis. Warderick Cut is one of the best cuts in the Bahamas - wide deep and straight. There is a short narrow shallow spot between the 3 outer moorings and the main mooring field. The N entrance to this channel is marked at the N by Red and Green buoys. Depth is ~7.5' at MLW. Arrangements for shipping packages from US via Ft. Lauderdale can be made through Watermaker Air at Staniel Cay. A Bahamas Defense Force contingent is located in the Park Office building. The closest source of propane is Staniel Cay. There is no pumpout facility available. Vessels should use holding tanks in the mooring area. The Park office has a well stocked store offering T-shirts, books, charts, souvenirs, and a good selection of the attractive Androsia print clothing. There are many areas available for snorkeling. The Park office offers handouts. Exuma Cays Land & Sea Park; 242-225-1791; 242-225-3281; exumapark@yahoo.com. Park office and Visitors Information Center located at northern mooring field. Beaches, beaches, everywhere! Beautiful white sand and clear water. Caution: there is a strong tidal current though the anchorage; take care while swimming in the channel. DVD rentals. The Park Office offers DVDs for rent at $2/day. Volunteer. Become a Park Volunteer; assist in Park projects. Boo Boo Hill, the highest point on the Cay, has mementos left by previous vessels - signs made from flotsam. Hiking: There are many hiking trails that allow you to explore the unique geology and ecosystem of the Cays. Trail maps are available in the Park office. As typical of the Cays, the limestone surface is well weathered with sharp surfaces and many holes; good footwear with toe protection is recommended. Hint: Take a small trash bag with you on your hike and do your bit to maintain its pristine conditions. Socialize: a weekly social hour with bonfire (weather permitting) is hosted by the Park Warden at the gazebo N of the office on Saturdays at ~1800. Bring something to drink and a snack to share. Socialize: organize your own Sundowner beach party by inviting fellow cruisers in the mooring field. Tides generally run about 20 minutes ahead of the Nassau tide station. Highbourne Cay Marina monitors VHF Ch-71. ECLSP offers opportunities for cruisers to volunteer for tasks to help maintain and improve the Park. The Park Administrator usually has a task list. However, when things are busy organizing of the task list may be a casualty. Check with the Park Office. Support ECLSP: Join the Support Fleet. Become an annual member of the Bahamas National Trust; receive two nights of free moorings at Warderick Wells. Contact ECLSP office. Support ECLSP: Bring something on the ECLSP Wish List when you come. Highborne Cay Marina broadcasts weather daily at 0800 on VHF Ch 06 after an alert on Ch 16.